Nissar A. Darmani, PhD, has been awarded a record WesternU research grant of more than $1.5 million to help cancer patients suffering from chemotherapy-evoked nausea and vomiting. Dr. Darmani is Associate Dean of Basic Medical Sciences in the College of Osteopathic Medicine of the Pacific (COMP). “The findings of this proposal will not only help patients suffering from the evoked nausea and vomiting, but will also introduce several new classes of broad-spectrum antiemetics, which will lower the cost of prevention of nausea and vomiting in diverse patient communities." The five-year grant is from the National Cancer Institute (NCI) arm of the National Institutes of Health (NIH). It is to investigate vomiting signals and crosstalk within brainstem and gut nerves as well as cells responsible for delayed-phase vomiting in the course of cancer chemotherapy with cis-platinum. “The findings of this proposal will not only help patients suffering from the evoked nausea and vomiting, but will also introduce several new classes of broad-spectrum antiemetics, which will lower the cost of prevention of nausea and vomiting in diverse patient communities suffering from cancer, HIV or gastrointestinal disorders,” Darmani said. Cancer is the second-leading cause of death globally and was responsible for 8.8 million deaths in 2015. The total annual economic cost of cancer worldwide in 2010 was $1.16 trillion, according to the World Health Organization. Darmani believes his research project earned NIH funding because of its strong preliminary data, as well as his recent publications deciphering the sequence of intracellular emetic signals for early-phase cisplatin-evoked vomiting. Serotonin as the major vomit neurotransmitter for the induction of early-phase has been known since the late 1970s. Cisplatin causes the release of serotonin in the gut, which subsequently activates serotonin 5-HT3 receptors present on vagal afferent nerves in the gut, leading to activation of brainstem machinery to evoke vomiting. However, the ensuing biochemical events occurring inside nerves/cells in both the brain and gut to produce the early-phase vomiting remained unknown until 2014, when Darmani’s laboratory published the sequence of emetic events in the least shrew model of vomiting. The cost of the best antiemetic (anti-vomiting) regimen (Akynzeo) containing a serotonin 5-HT3 receptor antagonist (palonosetron) and a substance P neurokinin NK1 receptor antagonist (netupitant) is currently more than $500 per pill in the U.S., according to Darmani. Darmani’s current research objective is to define the vomit signal transduction pathways for the delayed phase that occurs following release of substance P, and subsequent activation of NK1R in the central (brainstem) and peripheral (enterochromaffin cells in the gut) emetic loci in the least shrew model of emesis. 1 Reveal downstream PLC signals play a major role in NK1 receptor-evoked vomiting. 2 Show calcium mobilization is necessary for the evoked vomiting. 3 Identify a point(s) of emetic signal convergence whose antagonism/blockade could lead to the development of new classes of highly potent antiemetics against diverse causes of vomiting. 5 Explain why NK1 receptor antagonists behave as broad-spectrum antiemetics. “Based upon future results, potential cancer chemotherapeutics that do not modulate the identified emetic signals could be further developed clinically, which would save time, effort and research dollars in the quest for development of improved cancer therapeutics,” Darmani said. This NIH grant research award represents scientific peer recognition of the creative series of studies Dr. Darmani has proposed to understand the critical brain circuitry and neurochemical pathways underlying cancer chemotherapy-induced emesis, said Steven Henriksen, PhD, Vice President for Research and Biotechnology at WesternU. “This will lead to a better understanding of the mechanisms underlying a debilitating side effect of chemotherapy in cancer patients, and may potentially lead to better treatments and compliance strategies for human cancer patients," he said. Darmani, originally from Afghanistan, left the United Kingdom and immigrated to the US in 1988 to pursue postdoctoral research in the field of drug abuse at Medical College of Virginia (MCV). Reading published literature, Darmani found that physicians treating marijuana-smoking cancer patients experienced less vomits than the general cancer population when treated with cisplatin-like cancer chemotherapeutics. This finding led to the idea that marijuana may have antiemetic effects. 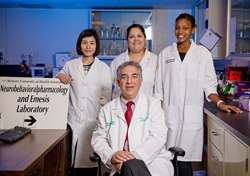 In 1991 Dr. Darmani accepted a faculty position in the department of pharmacology at A.T. Still University (ATSU), Kirksville College of Osteopathic Medicine (KCOM) in Missouri. There he came across a laboratory-bred colony of least shrews and found that the species can also vomit. Least shrews are a small species about the size of the human thumb, and live in the wild in the Midwest. Darmani began to characterize vomit circuits in this tiny species. He was the first investigator to define the receptor mechanism by which the major psychoactive component of the marijuana plant, delta-9-tetrahydrocannabinol, produces its antiemetic effect against cisplatin-evoked vomiting in the shrew. To pursue his marijuana anti-vomit research at KCOM, Darmani obtained several RO1 grants through the National Institute on Drug Abuse (NIDA) and the National Cancer Institute (NCI), which are major divisions of the National Institute of Health (NIH). One of his funded RO1 grants for more than $800,000 was transferred to COMP/WesternU upon his arrival in 2005. RO1 grants are highly revered sources of extramural funding for research institutions in the United States. Western University of Health Sciences (http://www.westernu.edu), located in Pomona, Calif. and Lebanon, Ore., is an independent nonprofit health professions university, conferring degrees in biomedical sciences, dental medicine, health sciences, medical sciences, nursing, optometry, osteopathic medicine, pharmacy, physical therapy, physician assistant studies, podiatric medicine and veterinary medicine. WesternU is home to the Patient Care Center, where the best in collaborative health care services is offered. The Chronicle of Higher Education named WesternU a Great College to Work For in 2012, 2013, 2014, 2015, 2016 and 2017.